WOMEN, older people and people on lower incomes are missing out on the benefits of cycling due to deeply-entrenched beliefs, new research commissioned by Cycling Scotland has found. The national cycling charity’s latest research looks at attitudes and behaviours towards cycling in Scotland. It’s the first time that Cycling Scotland has extensively explored general attitudes to cycling, in relation to other forms of transport, lifestyle choices and practical considerations. Cycling Scotland is keen to understand why people do – and don’t – cycle in Scotland. Encouragingly, the research found that around one quarter of the population cycle, at least occasionally and ten per cent cycle on a weekly basis. However, women, older people and those on lower incomes are less likely to be cyclists. Katharine Brough, head of behaviour change at Cycling Scotland, said: “Among these groups, a significant number of respondents either do not know how to cycle or do not feel fit enough. Close to two-thirds of non-cyclists were discouraged from taking up cycling as they felt they didn’t fit their image of a cyclist and didn’t know anyone who cycled. The cost of buying a bike can also be a barrier. Cycling is seen as a healthy transport option, and is the only transport choice (including a choice of walking, train, bus and car) that was seen as being an environmental choice. “This research begins a longer-term study into attitudes to cycling in Scotland. It will help us to develop our programmes and work in partnership with others to support parents, students, commuters, young and older people to access the lifelong benefits of cycling,” Kath continued. 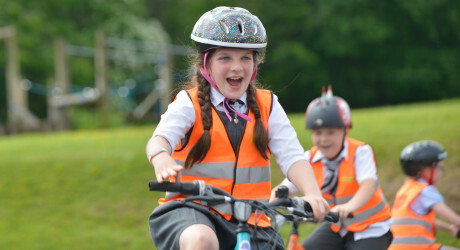 Cycling Scotland’s study is the first Scotland-wide longitudinal research into cycling behaviours and attitudes, designed to provide more specific data than that covered in the Scottish Household Survey or campaign-specific evaluations. It was carried out during August and September 2017 through face-to-face interviews with a representative sample of more than 1,000 people across Scotland. The full Cycling Scotland report: Attitudes and behaviours towards cycling in Scotland can be found online here, with a summary available here. Cycling Scotland is the nation’s cycling organisation. Working in partnership with other organisations, with funding from Transport Scotland, we help create an environment for everyone in Scotland to cycle easily and safely. Our vision is of a sustainable, inclusive and healthy Scotland where anyone, anywhere can enjoy all the benefits of cycling. Cycling Scotland is a recognised Scottish Charity no. SC 029760.